A drywall business can either be a one person operation, or employ a large crew. 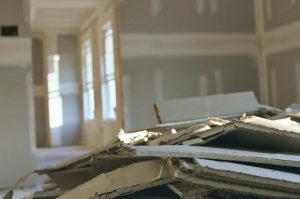 There are plenty of work opportunities for drywall installation and repair including residential and commercial new construction, renovations, and storm damage repairs, and more. Coming up with a good name for a new drywall company can be a fun, but challenging step when starting your new business. You may want to use your own name, or you may choose to use the name of the town or city where your business will be located. A catchy or humorous business name or logo is another option. Another idea is to have a creative tagline to go along with your business name. This can be helpful if you want to include other add-ons such as painting. Try to choose a name for your drywall business that is easy for potential customers to remember and that is easy to spell. Below are some examples of both unique and basic drywall business names you can use as inspiration when choosing your own name. Some names may be already used in your area, or might be trademarked, so make sure you properly research the drywall business name you are considering before registering it and having any marketing materials printed.